Me in front of a wagon at a local museum, ca. 2006. 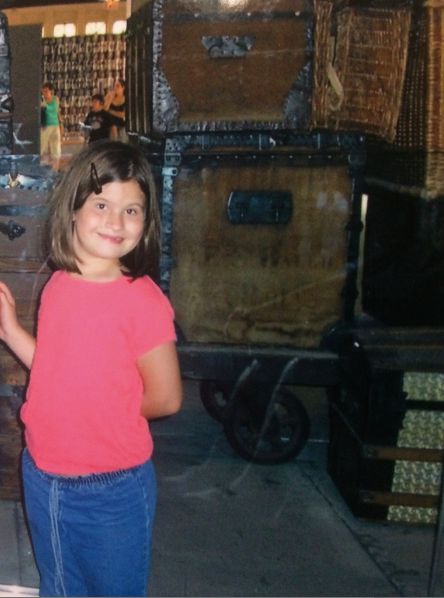 I’ve always loved history and poor hair decisions. My history begins with a photo album. The album follows the childhood and adolescence of my mother and her four siblings, tracing their stories. It is a green book overflowing with papers and letters. Everything that you could possibly imagine is stuffed in there. Birth records, First Communion Polaroids, school photos, and high school diplomas line the pages. Creases run through the binding now, and although it is almost five decades older than me, I am convinced the cracks come from the unbelievable number of times I opened it. Long before I knew what a major was, or that Hope College existed—even before I could read—I have clear memories of spending hours poring over that album. When I finally arrived at Hope College almost exactly a year ago as an undeclared History and English major, my mind floated back to that old photo album. Since I had learned to read, books and literature had taken over my life. All I did was read, taking in unbelievable amounts of information useful to almost no one. I could have told you all of the presidents in order, and I probably would have thrown in a random fact for each one (Millard Fillmore married his schoolteacher!). But as I threw myself into my history methods class and other upper-level courses, I found myself drawn more and more to the photographic evidence. What were they trying to say, I wondered. What were photographs trying to tell me? 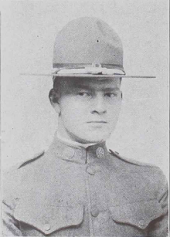 Ernest Vanden Bosch in his uniform. As it turns out, both the photographs you take and the photographs you find say a lot. I learned that most poignantly this summer. Along with my two research colleagues, Avery Lowe and Natalie Fulk, I researched the Holland, Michigan and Hope College experience of World War One. I was shocked at how moving the photographs taken during this time could be, even one hundred years later. For much of the project, I followed the exploits of Hope College soldiers at the front, told mostly through Hope College’s newspaper The Anchor. This was a fascinating experience, but it was not until I started to carefully comb through yearbook photos in the Milestone that their stories became real. These were men my age,who fought and died for my country. One of them, Ernest Vanden Bosch, lost his left leg in battle, returned to Hope, and graduated four years later as president of his class. Remarkable people, leading remarkable lives, reserved for posterity in a yearbook photo. All of these photos, and more, can be viewed at our website, “We All Must Do Our Utmost: Holland, Michigan in World War I.” While you’re there, I would advise you to take a look at the “Hollander Heroes” page, as well. Many of these men had no yearbook full of easily accessible photos to look back on. Instead, I was lucky enough to go and photograph their graves at Pilgrim Home Cemetery in Holland. Even though their journey here on Earth ended in Holland, their history journey had only just begun. Someday, when my college memories are just pictures in a photo album, I will include these soldiers, part of a history journey that is only just beginning.